Hi conflicting reviews is it a laser printer ora inkjet. Thank you for your question. The HP Colour LaserJet Pro MFP M477dw is a laser printer, meaning it uses toner to print rather than ink. 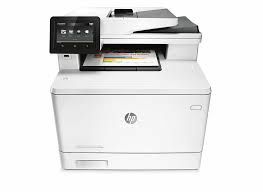 The HP Laser Jet-Pro MFP-M477dw All-in-One printer is a superior, multi-purpose office product available here at a lower than market price. This HP printer offers beautiful laser printing on large and small projects. The HP Colour Laser Jet-Pro MFP-M477dw All-in-One printer comes with built-in Wi-Fi and wired Ethernet connectivity options for flexible access by way of desktop, laptop, or mobile device. Connect directly to this laser printer with the 1 high-speed USB 2.0 port. LDAP authentication and Jet Advantage Private Print mean that touch-screen controls commanding printing and scanning with simple navigation are secure. Standard Native Adobe PDF application supports Scan-to-E-mail; Scan-to-cloud; Scan-to-USB; Scan-to-network folder; LDAP e-mail lookup; and Single-pass 2-sided scanning ADF features. There are distinct advantages to HP M477dw All-in-One printer. Namely the way it lays ink on a page at a moderate 26 ppm speed. Create precise documents with impeccable 600 x 600 dpi resolution. The weapon of choice of many small offices, this HP laser printer generates printed pages without any error. Engineered to meet the daily print production activities, the HP Laser Jet-Pro MFP-M477dw All-in-One printer is an excellent choice for desktop deployment by an individual user, or small workgroup. Like other HP printers, the main disadvantage of the Laser Jet-Pro MFP-M477dw is the limitations on paper tray supply. The printer offers a moderate print production rate, yet jobs may be stopped to accommodate manual paper tray restocking. A fine choice for a consultant or individual print manager, this machine is not equipped to handle mid-sized to large office printing schedules. This HP printer comes with a 12-month limited purchase guarantee. Source a reliable retail seller of HP specification replacement accessories to ensure no print job is interrupted.